Looking for something new to do in paper crafting? There’s a new place to go and play if you love creative challenges – Hand Stamped Sentiments! Every week the designing team of Erin Gonzales, Shannon Eberhardt and me will post a new challenge for you to conquer. Although we are dedicated to using Stampin’ Up! products in our creations, we want you to play no matter what your arsenal of supplies may consist of! Winners will be awarded the Hand Stamped Sentiments (HSS) Top 5 Badge, to wear proudly on their blog. If you don’t have a blog don’t worry. You can post you’ve won on your public gallery. Our first challenge is a color splash challenge. Now on to the projects. All SU products for these projects may be purchased on my online website or you may email me to place your order. I just received the Spring Song stamp set as a Sale-a-bration reward. I just couldn’t wait to use it. I love the little bird stamp and had to use the watercolor technique to color him. I first stamped the image on SU watercolor paper with Stayzon Timber Brown and I used the Dusty Durango Classic ink and blender pen to color his chest then used the SU Basic Gray watercolor pencil and blender pen to color the rest of his body. I used the Chocolate Chip and More Mustard watercolor pencils and blender pens to color in the branch and his claws. Using SU’s watercolor pencils and blender pen is so much fun! I used the SU the tearing edge to tear the edges of the watercolor paper and turquoise background paper then adhered these with SNAIL. Before adhering the gray CS to the card base I punched two holes with my paper piercer for the SU silver brads then adhered the gray paper to Rich Razzleberry card base. I used my new SAB Scallop Trim punch on the Dusty Durango CS and adhered this layer to the card then adhered the watercolor paper and turquoise CS layers to the gray CS. 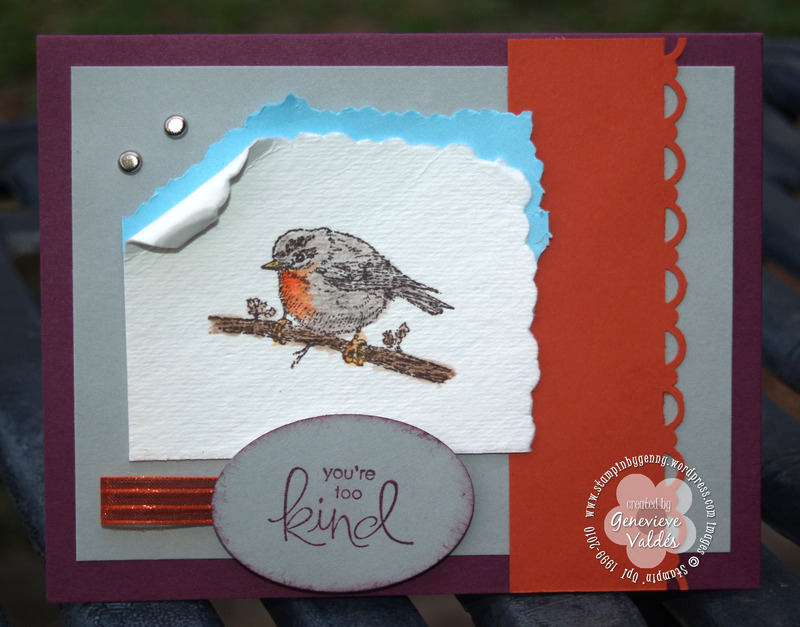 Stamped my sentiment “you’re too Kind” with the Rich Razzleberry then punched it out with the SU Wide Oval punch. I sponged the edges of the oval with Rich Razzzleberry ink. 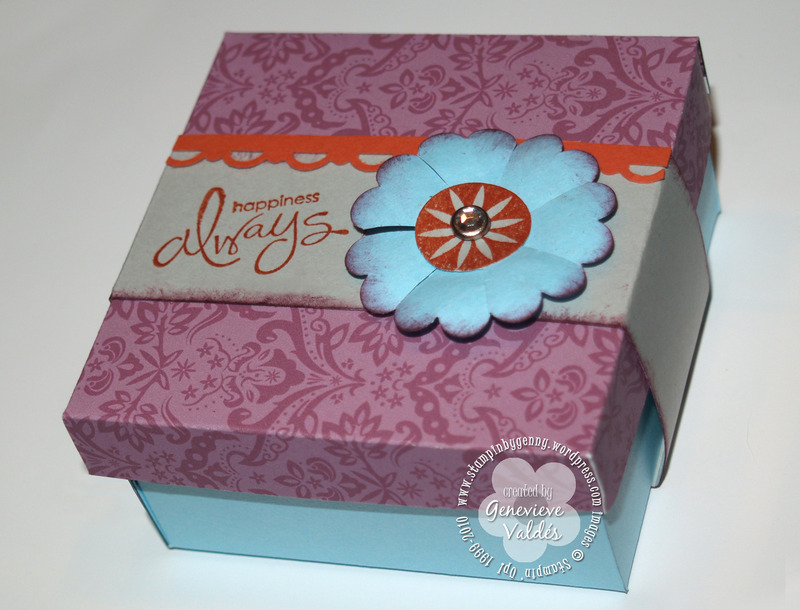 This little box is perfect for a gift or for yourself to store little treasures that make you happy. I used SU’s My Digital Studio to print the Razzleberry Brocade print on SU Whisper White. I then printed the box top template on the backside then cut it out. I also printed the box bottom template on the turquoise paper then cut it out. I used SNAIL to construct the top and the bottom of the box. The flower is punched out with the SU Scallop Circle punch. I then sponged the edges with Rich Razzleberry ink then made a cut between every second scallop. To get the petals to lift I placed the flower on top of my paper piercing mat. You can also use a piece of foam. You just need something pliable. I made little circles all over the back side of my flower with the flat end of my paper piercer, not the sharp end. There’s a really good video of making this flower here. I then stamped the center from the “Enjoy Every Moment” stamp set on the gray CS with Dusty Durango ink and used an SU clear rhinestone brad to attach the center to the Scallop flower. Instead of ribbon I used a paper sleeve enclosure. Then decorated the sleeve with the sentiment “Happiness Always” and Scallop flower.